Summary 0009752: Cannot sleep in retired forts or mountains anymore. Yeah, the sleeping feels weird, especially since they were one of the safest spots to camp out before, but not being able to make a campfire to heat a flask of ice or snow up is a problem. Having to land before you can travel feels like it is related to those changes, and I would love to hear it is a bug, but the specific "stable surface" message is discouraging there. Naturally if you make a camp which overlaps a mountain you can do all the usual stuff there. Also am I just derping and there is a way to put books in a bookcase that is already built? 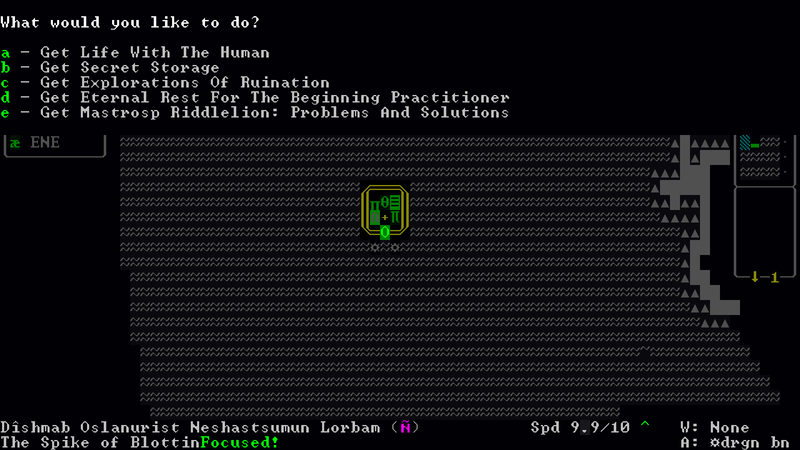 I was able to do it by putting them in the bookcase and THEN building it, and all of this is sitting on squares that I had just gotten "must come down from the mountains to do anything" messages before making the camp by standing at the edge of the range so it overlapped. Max, build it then press p then choose to "put in bookcase" you can do that with any built container now, its a new feature. Can you build campfires in a camp which you build in the mountains? If so, it's almost, kind of, like an undeclared feature than a bug. Rugged mountains being slightly harder, but not impossibly so, to hang out in than the mirthful forest. I haven't been able to put something in a bookcase that was already built, but you can put them on tables, in cabinets, in bags laying on the ground, and you can even put something in a bookcase which is just laying there, but not a built one. I did make campfires in that test camp (they're visible in my memory view just outside the door) so yeah, it's weird that it works but only in those conditions. You can also travel across parts of a mountain covered by a camp when you start inside the camp (love being able to travel out of them, at least) on a mountain square. Yes. Would be nice if that were expanded to let you travel out of worldgen camps, caves and dark pits when your adventurer starts in them.